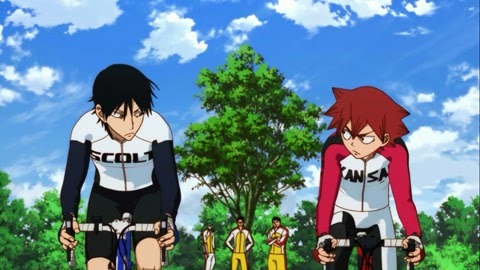 The Angriest: Yowamushi Pedal: "The Sōhoku High School Bicycle Racing Team"
Yowamushi Pedal: "The Sōhoku High School Bicycle Racing Team"
It is 4 November 2013, and time for episode 5 of Yowamushi Pedal. Onoda is shocked to discover Naruko has become a student at his high school, and is persuaded by Naruko to go with him to join the school's bicycle racing club. On the way they encounter three other prospective new members: Kawada, Sakurai, and the weirdly over-confident Terufumi. All six first-year students are expecting a warm welcome. Instead they are told they must compete in their first race immediately - and only the fastest two will compete in the inter-school championships. Yowamushi Pedal has shown the Sōhoku High bicycle club a few times already, but only ever in relatively brief snippets. It has taken until this fifth episode to actually send the lead characters over to try and join them. I actually like the patience in that, particularly in a series that has such a high episode count. It has given the audience time to get to know and like Onoda, Imaizumi and Miki, and certainly experience Naruko - I'm not sure like is the best word, but I am warming to him a little. The pace here is rather slow, leading up to a bicycle race rather than actually presenting any of it. That hurts the episode quite a bit, since there isn't quite enough left to make up for its absence. We don't really get into the heads of the senior year cyclists, neither do we really get a proper introduction to Kawada or Sakurai - which makes me suspect they're bailing out when they lose the forthcoming race. Then there's Terufumi, who prattles on about his extensive road racing experience so much that he's essentially Sean Bean in Ronin: all talk and no action. I strongly suspect he will crash and burn hard in the next episode or two (depending on how many episodes they use to stretch out the qualifying race) as a sort of stereotypical lesson on overconfidence. In this episode he's simply annoying in a way that is not particularly entertaining. That pretty much leaves Imaizumi and Naruko to psych each other out in the lead-up to the race, and for Onoda's charming naivete to push him through. In this case I'm really not sure it is enough. The plot has moved forward a little, but it hasn't provided much as it goes. I liked the previous four episodes much better. I think this one sadly just scrapes under the line to become Yowamushi Pedal's first dud. The quality ratio slips to 80 per cent.